Lynx coach Cheryl Reeve reminded basketball fans Tuesday night there are more important things in life than stopping the opposing team from scoring. 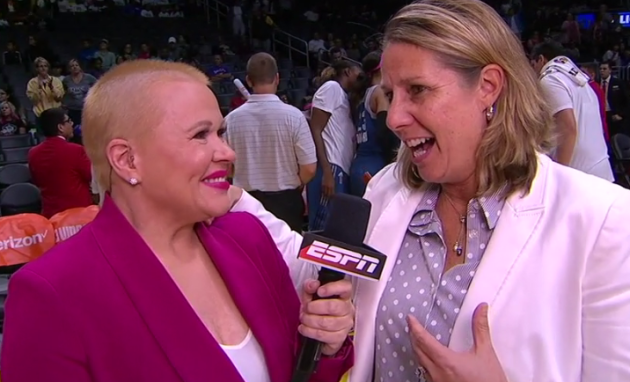 Reeve interrupted her own interview during Tuesday’s 77-74 victory against Los Angeles to show her support for ESPN sideline reporter Holly Rowe, who is battling breast cancer. Rowe opened the in-game interview with question about stopping the Sparks' top-scorer and after a brief response, Reeve said “But more important Holly, no matter what’s going on in the game, what’s more important is what’s going on with you. Rowe fought back tears during Reeve’s message.